The strong concept offers distinct advantages, such as two parallel telescopic beams, assuring max overlap. Beam sections are dimensioned to absorb not only the vertical, but also the very considerable horizontal forces. INNOVATION’s new and improved design implies a New Generation 817 INN. spreader with the unique combination of increased structural strength and 16% reduced weight. 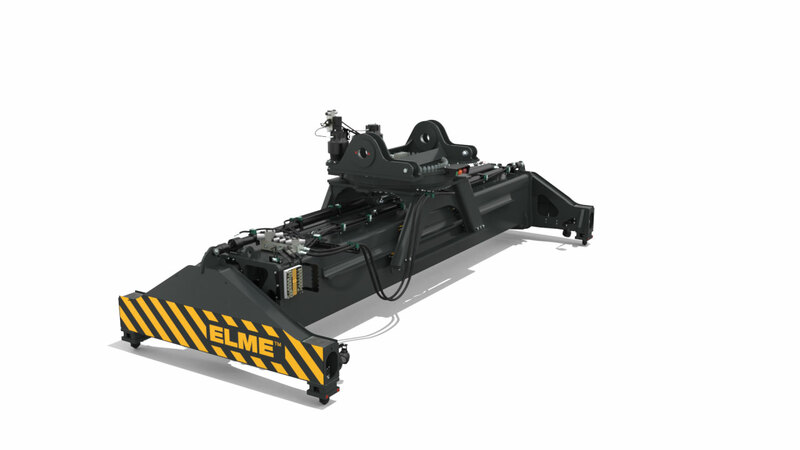 The reduced spreader weight enables improvements on the reach stacker design and makes it possible to increase the lifting capacity in second and third container row. The New Generation design also implies numerous improvements to promote easier service. Telescoping is powered by one hydraulic cylinder for each end beam and sideshift is executed by one hydraulic cylinder. The cylinders are positioned on top of the main frame. Rotation is done by a slewing ring with double transmissions for turning and brakes for holding. Telescoping speed 20-40ft < 16 sec. Telescoping speed 40-20ft < 18 sec. Sideshift ± 800 mm < 20 sec.